What could be better than a 1 g bar of fine gold? 10 gold bars of course. 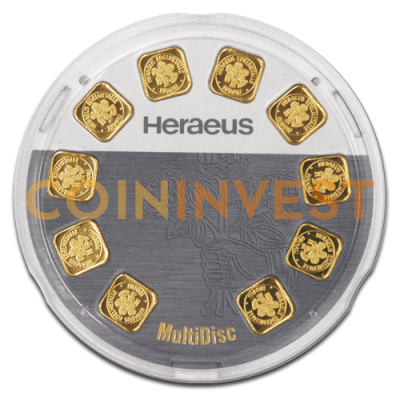 This exciting product from revered German refiner Heraeus features 10 individually numbered bars of .9999 purity 24 carat gold. The rotating dispenser allows you to remove bars one at a time without any damage. Each bar is fashioned in the famous Heraeus square format and features the refiner's crest on one side with the weight and purity stamp on the other. The Multidisk enables you to purchase 10 individual gold bars at a lower price than you would pay if you bought them one at a time. Presented in unique circular packaging that is innovative and attractive; the Multidisk is made from durable, high-quality polycarbonate that allows you to appreciate the beauty of gold without fear of scratching or damage. 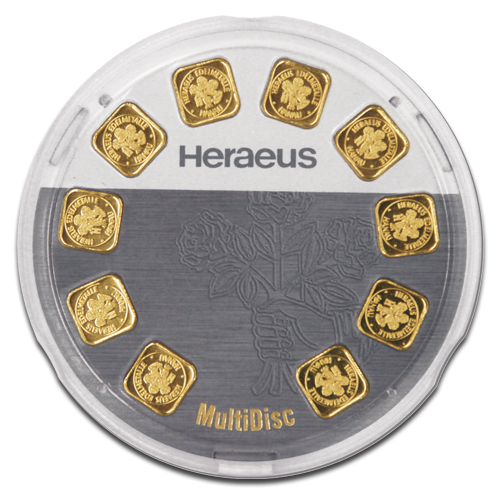 The 10 x 1 g Heraeus Multidisk makes a great gift as well as a smart investment. CoinInvest strives to find the very best gold products for its customers and these 1 g gold bars in their unique circular packaging are a popular choice. Because we buy in bulk we are able to offer the lowest prices and all CoinInvest.com orders are shipped promptly.